In as much as I promote buying and preparing fresh produce, I really have no problem with using frozen sometimes. Frozen vegetables are supposedly picked at their peak and frozen immediately, allowing less deterioration of nutrients. I can’t, however, say the same about canned. Thumbs down on that one. In general, I tend to use frozen vegetables more in cooked dishes than in raw. There are quite a few frozen vegetables which are staples in my kitchen including artichoke hearts, edamame, corn, chopped spinach and especially peas. Believe me, I adore fresh peas. If they are picked off the vine and prepared right away, they can be so amazingly tender and sweet. But if they’ve been sitting around for too long, those sugars become a little starchy. Plus, they do take a bit of time to remove from the shell, which sadly I don’t have the leisure to do on a busy weeknight. Peas are a great source of protein and fiber, so I love adding them to pastas, soups, stews and grain-based dishes for a complete protein. Peas also contain substantial amounts of many other vitamins and minerals, including Vitamins C and K, as well as Folate and Manganese. I post the contents of my kids’ lunch boxes every Monday on Facebook, so I know many of you saw a lunch Mr. Picky made a month or so ago with frozen peas as the entrée and frozen corn as the side dish. (They defrost by lunchtime!) That was by far the quickest healthful lunch we’ve packed all year! 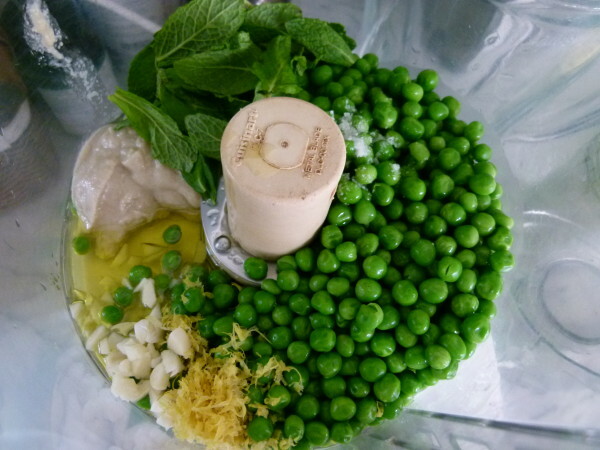 Although fresh peas come into season in the Spring, I use frozen the whole year long. 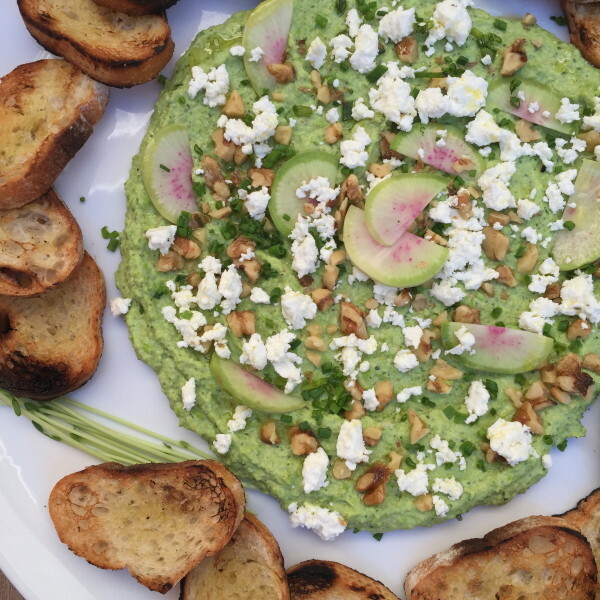 I first taught this delicious dip in a December holiday hors d’oeuvres class, but I made it recently for a dinner and it really sang spring. 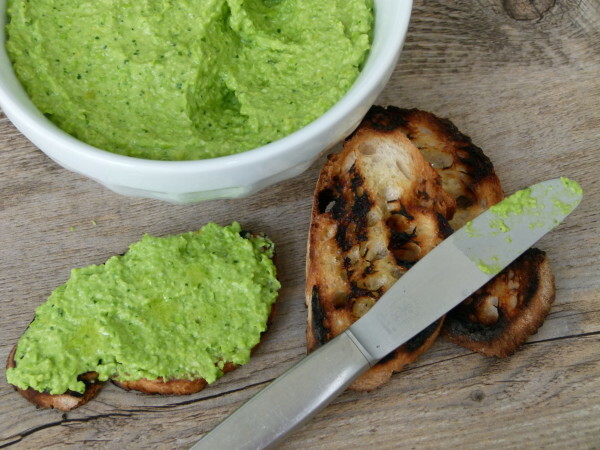 This dip is a bit like hummus, the Mediterranean dip made from pureed chickpeas, tahini (sesame paste) and garlic, although not quite as thick and rich. Instead, this has such a lovely light, fresh flavor from the mint and lemon zest. It would be such a nice addition to your Easter festivities, whether you’re doing a brunch, lunch or dinner. Even if you have your whole menu planned, I bet you have almost all the ingredients to make this dip today. Best of all, it can be made in about 5 minutes or less. Seriously! 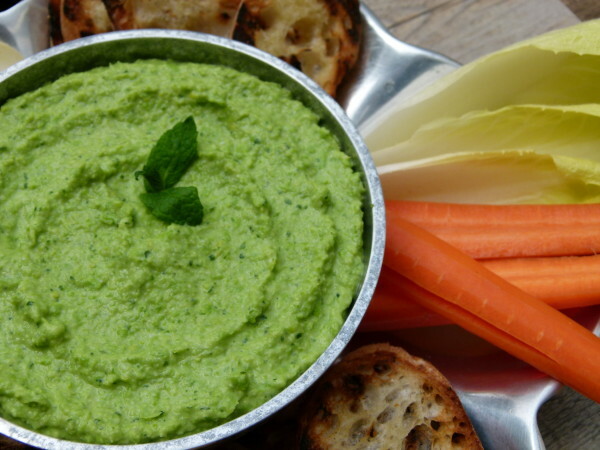 You can definitely serve this dip with pita chips or toast points. But I love it with crudités like carrots or endive leaves or my favorite (and more indulgent), slices of grilled baguette. If you have some nice Pecorino-Romano cheese, shave a little sliver onto each crostini and you will be in heaven! I wish you all a beautiful and joyous Easter. My husband and I were feeling brave enough to take the three kiddies to Europe again, so we’ll be in London for the next week. I hope to post some pictures of our adventures on Facebook! Always interested to hear about your faves and must-sees! If using defrosted frozen peas, skip to Step 2. If using fresh peas, fill a large bowl with ice water. Bring a pot of water to a boil, add peas and cook for 2-3 minutes. Plunge them into the ice bath to halt the cooking process. Drain well and pat dry. Place all the dip ingredients in a food processor and puree. 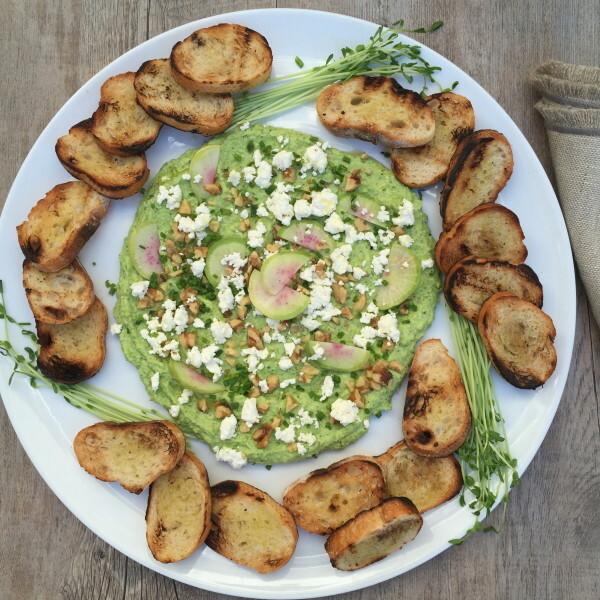 Serve with crostini and/or raw crudités. If you assemble the dip on crostini, you can also shave pecorino or parmesan on top of each hors d’oeuvre or sprinkle grated cheese on top and drizzle a good olive oil over all of them. Preheat oven to 350 degrees. Line a baking pan with parchment paper. 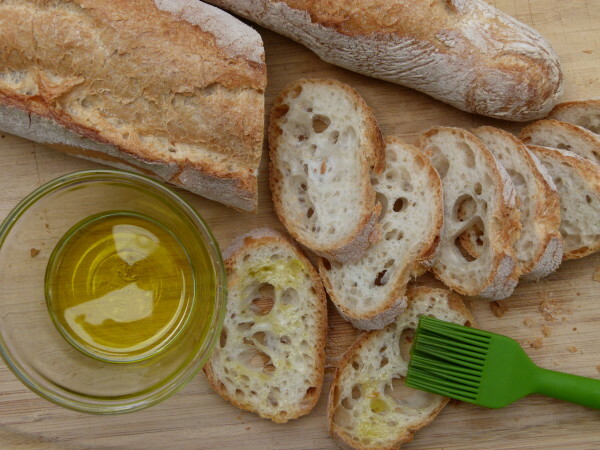 Brush each side of bread with olive oil and place on pan. Bake for 15 minutes, turning after 7 or 8 minutes. Use immediately or store in an airtight container for several days. 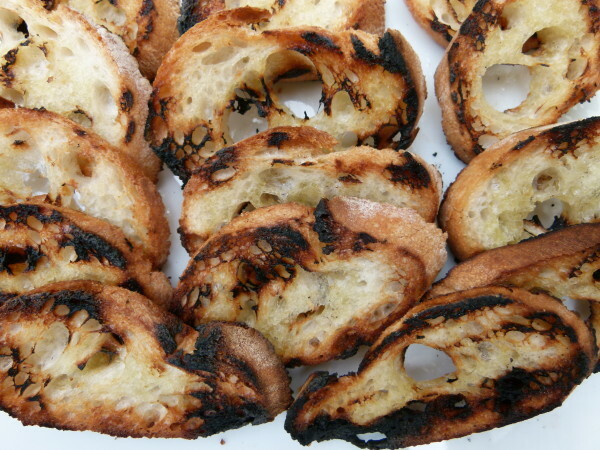 Or preheat a grill over medium heat and grill the bread (brushed with a little olive oil) until slightly charred on both sides. This only takes a couple of minutes. Can I make this a day ahead and just pop it in the fridge overnight? I realize it’s a quick recipe, but I would like to avoid cleaning a food processor just before brunch guests arrive. This worked beautifully. I stuck the plastic wrap directly on top of the dip and snapped the Pyrex lid on. The recipe was a hit, I will definitely make it again soon! Thank you! You’re welcome! It’s crazy easy to make! Thank you so much for this recipe, Pamela! It’s easy, healthy, and SO delicious! My family is asking me to make more! That’s fantastic! I’m so happy you let me know. Enjoy! This looks so good, can’t wait to make it!! A great light supper as it warms up, hopefully soon! !